Have you ever stayed away from certain foods as it creates an allergic reaction or affect your health? Although every now and then you try out and experiment with new cooking and bizarre foods, you prefer to stay from the foods that could harm you. Well, the newborn baby is just like you, but in terms of safe and unsafe foods. However, you should have the awareness whether the food is safe or unsafe for your baby. Introducing the new foods to the babies every now and then can be very exciting for the moms, especially, the first time mothers. There are many foods that are unsafe for little ones! Needless to say, that mother’s milk the only safest food for the babies until 6 months. Women across different countries with different backgrounds have this one thing in common. Except the breast milk, no other food is safe for the babies in the first few days of birth. However, due to lack of sufficient breast milk in few mothers, formula can be used as the alternative. However, there are a few exceptions where 5 month old babies are fed with solid foods like porridge, boiled vegetables, etc. Not all the babies are same and so as the digestive system! Cow’s milk is dangerous for the newborns and even until one year. It is not recommended to feed cow’s milk until completion of 2 years of age. Your baby’s digestive system is not capable of digesting the protein from the cow’s milk. Besides, the cow’s milk could damage the kidneys! Safely stick to formula milk or breast milk until 6 months. It provides all essential nutrients to your baby! From 6th month or even a month earlier, moms will try feeding solid foods for the babies. It is really appreciable if you try to inculcate a healthy eating habit and feed a variety of foods. 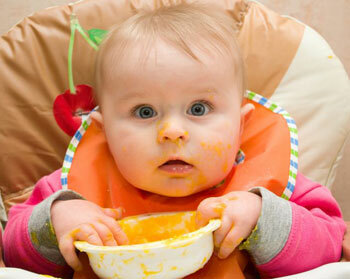 Yet, this is a crucial stage in overall baby growth, where the wrong choice of food may turn detriment to the health. Since the baby doesn’t have a fully developed digestive system, even the health properties of honey turns into toxic for babies. Honey can attract bacterium infection, which would result with developing infant botulism. It is a rare kind of food poisoning in babies, and alarming a fatal condition. Similar to cow’s milk, babies could not digest the soy milk or other soy products until 2 years of age. It will be harmful to the health if you attempt to feed soy milk to the baby until the baby turns one year. Say a big no to foods that are high in sugar and salt. While it is recommended to add a pinch of sugar and of course salt, excessive salt and sugar not just harm the kidneys of the babies, but also have an impact on the health in the long run. For instance it may lead to diabetes, thyroid, blood pressure, etc. Candies, jellies, chips, fried foods, etc. Simply feed the home cooked foods and say a big no to packed foods. While sea foods are loaded with tons of nutrients, it is harmful for babies! Rich in minerals and essential fatty acids, with zero fat and low carbohydrate, sea foods are recommended even by physicians! Yet, it is not good for your babies. The high mineral content could harm the baby’s health, vital organs and even impact the brain development. Stay away from feeding sea foods until 3 years of age. Even the vegetables may turn unsafe food for the babies! Yes, the veggies are not boiled properly; say half-cooked foods may cause severe indigestion, which is not an easy condition to treat! Chop the fruits or vegetables finely to avoid choking. Don’t feed any sticky or soft foods like jelly as it might get stuck in the airway of babies. Nuts and nut butters are harmful to the baby’s health. Nuts are healthy, but not for the babies aged less than a year. While citrus foods are rich in Vitamin C, they are acidic in nature. It is good to avoid feeding citrus fruits until 18 months. Don’t add too many spices to the foods. It is always better to stay away from spices until your baby’s digestive system fully grown.